Who Will Be Named NAILS Next Top Nail Artist 2015? After 10 grueling weeks of competing, three talented ladies are putting their best nails forward in the final challenge. On January 25 at ISSE Long Beach, one of these artists will be crowned NAILS Next Top Nail Artist. Last year Ryoko Garcia became our first NAILS Next Top Nail Artist. We knew those would be some tough shoes to fill when we set out on our search for a new nail artist to take the title. This year we introduced CND’s Last Chance Design Lab where the eliminated contestants had one more chance to battle each other one-on-one for an opportunity to get back in the competition. Congratulations to Danielle Costantino and Lexi Martone for making it through the 10 weeks without being eliminated. And a special congrats to Lavette Cephus, who won two straight Last Chance challenges in a row to earn her spot back in the finals! As of press time, these three talents are busy working on their final challenge that will be the deciding factor as to who will be named NAILS Next Top Nail Artist 2015. Read on to get to know these three top techs a little better. Which one will reign supreme? 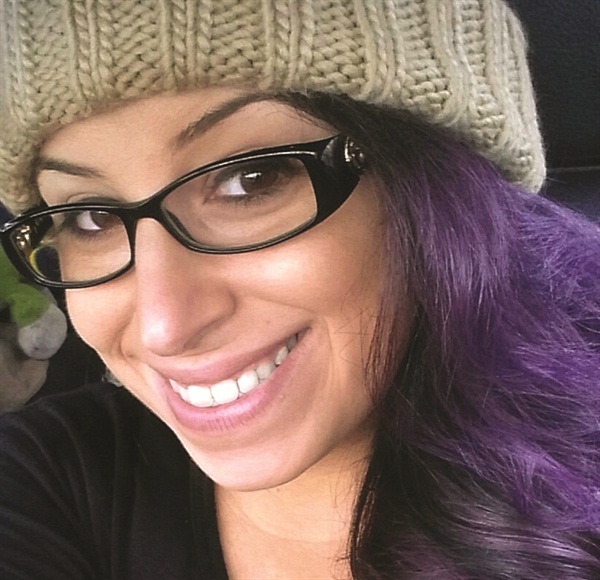 Hailing from Cranston, R.I., Danielle works at industry veteran Gina Silvestro’s salon Gel Essentialz. She’s the newbie of the bunch, having only been doing nails for about three years. Before the competition, she was primarily a gel and gel-polish only nail tech, but she’s showed solid skills in all mediums throughout the weekly challenges. Danielle was in the top three in five of the 10 weekly challenges, and secured her one win during Entity Beauty’s Celebrating 10 Years anniversary-themed challenge. With 35,000+ Instagram followers, it’s no wonder she excelled in social media votes. NAILS: How does it feel to make it to the Top 3? Danielle: Making it to the Top 3 is still surreal. It’s the first time I’ve been proud of myself. It feels amazing to know I got here all on my own. Hard work, dedication, and vision all aligned for me and it’s an amazing feeling! I’m so thankful to NAILS for holding the industry at such high standards and giving us a platform to make our mark on the nail game. NAILS: What was your favorite challenge of the first 10? Danielle: My personal favorite nails I did were for the Week 6 Dashing Diva challenge. But my favorite challenge was obviously the Week 5 Entity challenge because I won! NAILS: What challenge did you find the most difficult? Danielle: Probably the Week 3 Orly challenge. I had a hard time comprehending what was exactly wanted from us. I went in a different direction than most of my competition, so I had a feeling I misunderstood. NAILS: What do you think you’re best known for? Danielle: I think I’m best known for my salon gel nails with crazy bling-y designs, which is what I do on a daily basis. NAILS: What do you think is the greatest strength of each of your two final competitors? Danielle: Lexi is talented! I think her talent is bigger than even she knows yet. And Lavette has strength and perseverance, as do I. I know how hard it is to try and beat someone who will never give up. We both have a child and will be going hard to make our babies proud! NAILS: What has the experience of being in the Top 12 of NTNA been like? Danielle: It’s a dream come true. I never thought filling out an online form would have brought me all this way. NTNA is like a way to introduce yourself to the best of the best! We have to make people notice us. Otherwise all the hard work, sleepless nights, and tears were for nothing. NAILS: What was your best moment of NTNA so far? Danielle: Definitely becoming close to Simone Gilbert. I never would have dreamed I would make a lifelong friend who lives on the other side of the world. Even with being eliminated she was motivating me and worrying about my feelings. She’s an amazing person, mom, and friend! I value friendship on a different scale over winning and losing. I’m thankful for being in the competition, and I’m proud to call her a friend! NAILS: Who has been your biggest supporter throughout the competition? Danielle: My biggest supporters were definitely my mom and my co-workers! Phoung Luu (The Nail Boss) and my hand model/friend Emily Garcia were also huge supporters throughout the competition. NAILS: Do you have any sage words of advice to future NTNA competitors about the competition? Danielle: …I will be the happiest girl in the world. I’d want to take my mom and son on a Disney Cruise, and donate half the prize money to a single moms’ education charity. A nail tech for the last seven years, Lavette owns her own business, Beautè Asylum, in Toledo, Ohio. She came into the competition well versed in a variety of mediums, but focused more on acrylic and handpainting. She quickly added gel to her bag of tricks. A top three contender for three of our weekly challenges, Lavette won the Gelish Pay It Forward charity-themed challenge. Eliminated in Week 9, Lavette went on to beat out Lauren Boyd and Simone Gilbert in CND’s Last Chance Design Lab. With almost 4,000 Instagram followers, she’s actually the underdog when it comes to social media reach. Lavette: Being in the Top 3 feels unbelievable! I feel like I’m in a dream, then I wake up and realize my dream has come true. I cannot describe how grateful I am. Lavette: My favorite challenge was Week 8: Pay It Forward. This challenge allowed me to take a moment to reflect on an organization that shaped my future and helped me on the path to my dreams. I loved being able to create a piece of art that captures the spirit of Mom’s House and showcase it to the world. The entire experience was so inspiring! And it was the first challenge I won. Lavette: The Week 2 Bio Seaweed Gel challenge was very difficult for me. The entire design had to be sculpted from gel, which was scary because I had never done it before. But I quickly realized that this competition was all about learning and pushing me to new limits! Lavette: I feel I am best known for intertwining positivity, inspiration, and creativity by turning it into artwork. 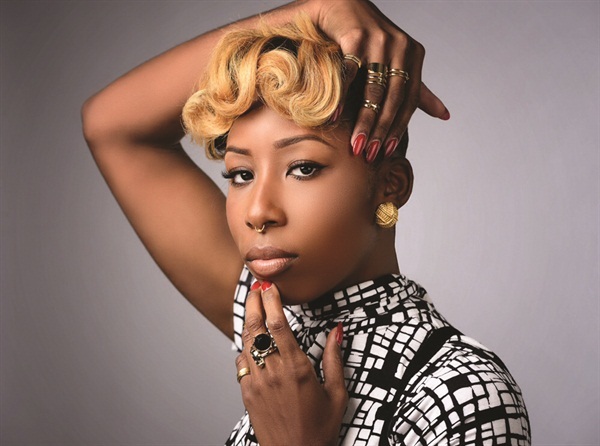 Lavette: My competitors really serve as an inspiration to me! I love learning from their artwork every week. I really admire Lexi’s ability to take a challenge and execute it. Danielle learns quickly and has great precision overall. Lavette: The Top 12 has been quite the rollercoaster for me. From the highs I experienced being in the top to the lows from being in the bottom, I have experienced many emotions on this crazy ride. The twists and turns allowed me to push through while learning new skills and techniques. Though it was scary and exhilarating, at the end I would still do it again. Lavette: The best moment for me was when Jan Arnold chose my designs for the Last Chance Challenges. To have my fate in the competition hanging on one nail was so nerve-wracking. But to be chosen was one of the most amazing feelings I have ever felt. Lavette: I have been blessed to have an amazing support system, from my family and friends to my clients who voted for me every week. My biggest supporter has been my daughter Serenity Ramos! She is my biggest cheerleader and has been my inspiration throughout this entire competition. I am truly blessed to have her. Lavette: My advice to future artists in this competition is to never doubt yourself. If you work hard, plan accordingly, and believe in yourself there are no limits to what you can do. Lavette: …I will have the proudest daughter in the world! This would truly be a blessing so that I can teach others that your dreams are always in your reach if you never set limits on yourself. 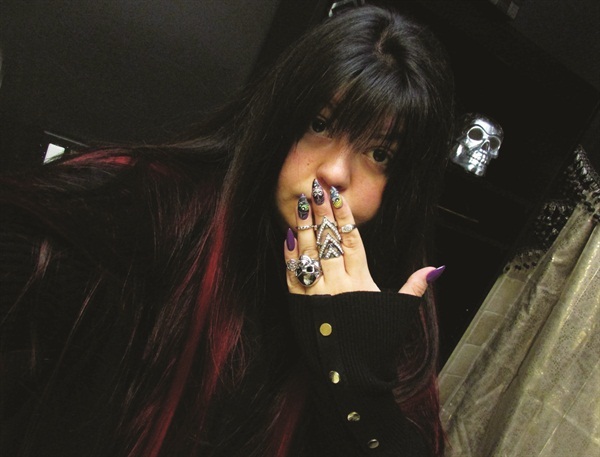 Lexi Martone is no stranger to NAILS Next Top Nail Artist. A Top 12 competitor in last year’s competition, she was eliminated in Week 7 on a Halloween nail she’ll probably never forget. She’s only been doing nails professionally for a little more than two years but that didn’t keep her from being in our top three in the weekly challenges eight times, winning a record five weeks. (Lexi won Orly’s LA Manicure, INM’s International Nails, Dashing Diva’s Bejeweled, and SuperNail’s Super Heroes & Villains challenges.) Known for her precision in both handpainting and sculpting, Lexi is a force to be reckoned with, and she has nearly 34,000 Instagram followers. She operates a nail studio in Dix Hills, N.Y.
Lexi: It is a total relief to make it to the Top 3. I feel like I’ve been working forever to get here and it’s all finally paying off. I could not be happier to be here and I am super excited to do this final challenge! Lexi: I loved both the International Nails and Superheroes & Villains challenges. I thought they both gave the most creative freedom to be totally out of the box and push boundaries. Lexi: I really struggled with Steampunk. Sometimes you just don’t click with a concept and everything you do feels like a failure. I just couldn’t pull something together that I really loved. Lexi: No matter what I’m doing I put in a lot of time and attention into being clean and precise. I am a super OCD perfectionist when it comes to my fine lines and details. That’s something I carry through all of my work. Or, you know… maybe I’m known as that girl who likes witches. Lexi: Danielle is really great at handpainting and Lavette has some really creative concepts. They both also create clean work. Lexi: It’s definitely the most work-intensive thing I’ve ever done. You need to be on top of your game at all times because there are no breaks. Before you finish your current challenge, your next one is already there. There are times where you just get frustrated and want to call it quits, but at the end of the day it’s the best thing I’ve ever done. Lexi: I set the record for most challenge wins! I’ve been Top 3 for 8/10 challenges and won 5/10 challenges. Lexi: Luckily I’ve had so many supporters it’s hard to name just one. Obviously my mom is my number-one fan. She would drive everyone up the wall once voting started every week. A bunch of my friends would make all of their clients vote while they were at work and the rest would share the link. As far as emotional support is concerned, my friend/agent Elle was always the one to “talk me off the ledge.” Whenever I wanted to scrap things at 2 a.m. before a deadline or when my ideas were all over the place, she was there to reel me back in. Lexi: I encourage everyone to enter the contest. However, make sure you know what you’re getting yourself into. This isn’t easy and it’s going to consume a lot of your time. Make sure you are comfortable with all mediums going into this and that you are 100% dedicated. It is also super important to use your time wisely. Start as soon as you get the challenge. Don’t be the person working until the last second of the deadline. I’m that person. Trust me…don’t do it. Lexi: Honestly, I just don’t know. I’m just going to see where it takes me and what the world has in store for me. This is my second time in the competition and from last year alone I’ve been given so many amazing opportunities. I didn’t even make the Top 3 last year and so many doors have opened up, so I can’t imagine what winning would do. I’ve worked with celebrities such as Jennifer Lopez, Katie Holmes, Jay Manuel, and the Victoria’s Secret Angels. I mean if you told me I would be doing JLo’s nails last year I would have laughed. If I win, I’m just going to embrace every opportunity that comes with it. We also asked our Top 3 why they should be NAILS Next Top Nail Artist. Read their responses at www.nailsmag.com/2015top3.